Hi again everyone :) Firstly, please check out my Tag It Wednesday with a video tutorial on how I did my mixed media tag for this week. Now for my card. I've made a second card for Inky Paws challenge, using wood as my choice of texture & also entering it for Simon Says Stamp Wednesday challenge. Hope you like it! The flowers are from Newton's Nook Love Grows stamp set and the sentiments are from Simon Says Stamp Birthday Messages stamp set. Very Pretty! I love the watercolored flowers and the bits of wood texture! 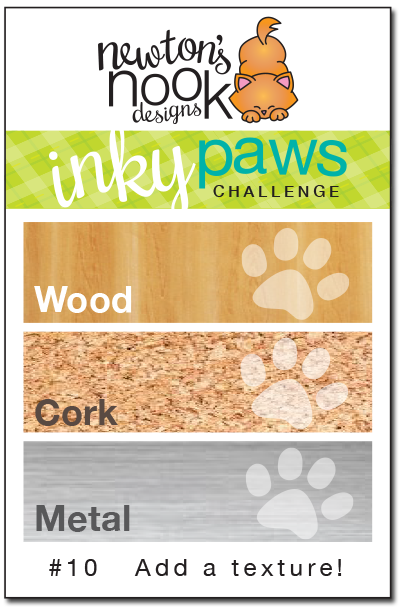 Thanks for playing again with our Inky Paws Challenge at Newton's Nook Designs! Your card is so beautiful. I love your flowers and colour combo you used. Absolutely gorgeous, Marina! Great colour choices and textures. Thanks so much for playing along with the Simon Says Stamp Wednesday Challenge: Anything Goes!